The commemoration of the 40th anniversary of the Green March is no ordinary event or passing celebration. In fact, it is a watershed moment in the process to complete the Kingdom’s territorial integrity. We want this Development Model to seal these provinces’ integration into the unified homeland and to enhance the influence of the Sahara region as an economic hub and a crucial link between Morocco and its African roots. To me, what matters most is to make sure the dignity of our fellow citizens in the Sahara is safeguarded – particularly that of younger generations – and to strengthen their love for their country and their attachment to their homeland. The implementation of advanced regionalization bolsters Morocco’s credibility and shows our country honors its commitments. To make sure the Southern Provinces are front and center of the implementation of advanced regionalization, a series of program-contracts will be concluded between the central government and the regions to determine each party’s obligations regarding the execution of development projects. I therefore call on the Government to speed up the adoption of legislative texts on devolution and support that with the transfer of qualified human resources and funds, with a view to replicating that experience in the Kingdom’s other regions. We also have to speed up the preparation of a real charter for administrative devolution that gives regional departments and agencies the prerogatives needed to run the region’s affairs at the local level. Morocco committed to guarantee peace and security. Today, the Moroccan Sahara is the safest area in the Sahel and Sahara region. Where have the millions of dollars of humanitarian aid gone – more than 60 million Euros a year – not to mention the billions of Euros spent on armament for the separatists and on their propaganda and apparatus of repression? How can one explain the fact that the separatists’ leaders are obscenely rich and have real estate and bank accounts in Europe and Latin America? This means that for forty years Algeria could not – or did not want to – build 6,000 housing units to safeguard their dignity. That amounts to an average of 150 housing units a year. Why does Algeria – which has spent billions on its military and diplomatic war against Morocco – let the Tindouf inhabitants live in such appalling, inhuman conditions? Those who are waiting for any other concession on Morocco’s part are deceiving themselves. Indeed, Morocco has given all there was to give. It has given of its sons’ blood to defend the Sahara. This is the same principle we uphold in dealing with certain parties inside international organizations that do not know Morocco’s history and seek to come up with scenarios which are hatched in air-conditioned offices, are far removed from reality and are presented as proposals for the settlement of the regional dispute over the Moroccan Sahara. Morocco has the right to invite its partners – states as well as global companies – to benefit from the investment opportunities to be created in the region, thanks to the large-scale projects that will be launched. Just as we make no distinction between the northern and the southern parts of Morocco, we see no difference between tomatoes from Agadir and those from Dakhla, sardines from Larache and those from Boujdour, phosphates from Khouribga and those from Boucraa – even though the latter represent less than 2% of our national reserves, as confirmed by universally recognized data. 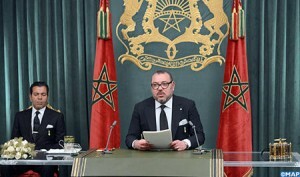 With the same resolve and steadfastness, Morocco will also face up to all attempts that seek to cast doubts on the legal status of the Moroccan Sahara or question our country’s right to exercise its powers and prerogatives fully on its land, in the southern provinces, just as it does in the northern part of the country. This means we must all step up efforts and remain vigilant and fully mobilized to make our just cause better known, to shine a spotlight on the progress our country is making and to confront our enemies’ schemes. This would be the best token of loyalty to the architect of the Green March, my revered father His Late Majesty King Hassan II – may he rest in peace – and to the memory of the nation’s glorious martyrs.